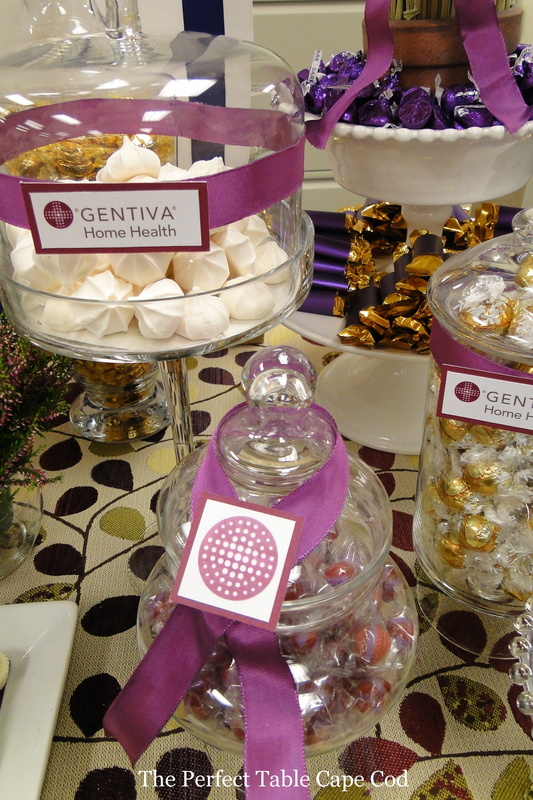 The Perfect Table Cape Cod was happy to be able to sweeten up the Gentivafest Recruitment and Open House with our Autumn inspired table! This is a busy weekend for the Perfect Table crew. We will be setting up a table at the 27th Annual TD Bank Pops by the Sea Auction, which takes place the Saturday before the concert. We hope to delight the bidders! With conductor, Keith Lockhart, and celebrity conductor, Jim Belushi, it should be quite the treat! Belushi will join the Boston Pops Esplanade Orchestra on the Hyannis Village Green on Sunday, August 12, 2012. The concert benefits the Arts Foundation of Cape Cod. For more information about Pops by the Sea and the Arts Foundation of Cape Cod click here. With summer comes celebrations! This summer we celebrated high school graduations. This grad is on her way to San Francisco this fall, but black and white were "must-haves" for her candy table. We incorporated the black and white theme by creating a black "golden" gate bridge and some historic black and white San Fran images. In almost total contrast, this graduate is off to American University down in DC! We created a table that reflect her choice in school and her fabulous personality. Here's a red, white and blue table that says, goodbye, Mom and Dad and hello, college! What could be more sweet than a table of sweet treats at a Sweet 16th Birthday party?! Our answer: nothing. We celebrated this teens birthday with a table of candy and baked treats. The birthday girl is quite the dancer, so we incorporated her favorite pastime into our theme of black, white, and pink. The new year has already brought much happiness for our friend Caitlin. Caitlin and her husband, Aidas, welcomed baby Darius to the world in January, but not before throwing a beautiful baby shower to welcome his arrival. The baby shower mirrored the baby's bedroom colors and theme with sailboats adorned with blue and green. 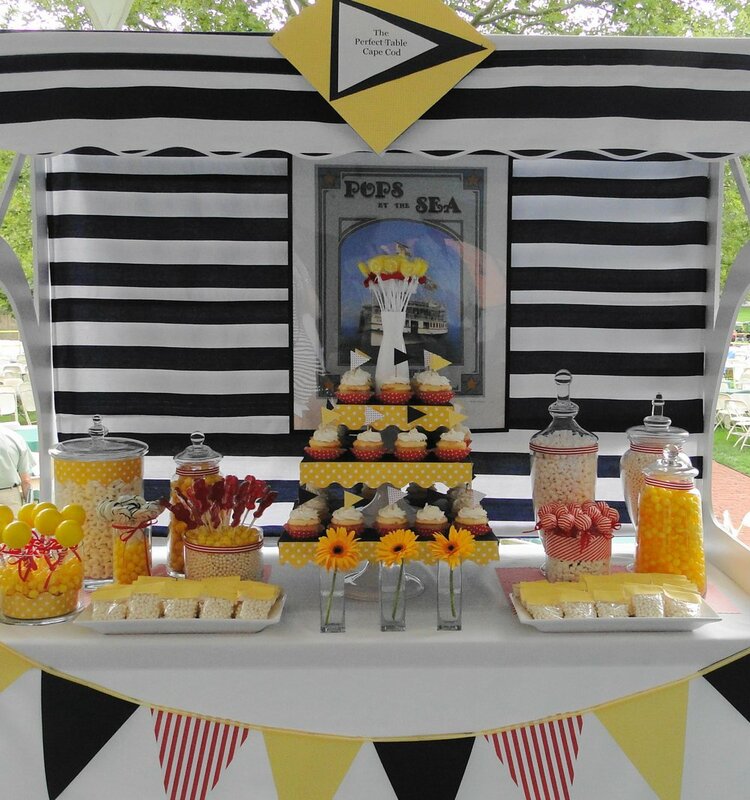 From mini trifles to cake pop filled buckets, there was a sweet treat to suit each guest. Here's to hoping you and your family had a wonderful holiday season and a happy new years! This Summer we were delighted to be involved in a backyard summer wedding on Cape Cod. The bride and groom were wed on a cruise ship off the coast of New York and then ventured back to their home town to celebrate. They chose to incorporate the nautical theme while tying in their beachy roots. We designed a dessert table to fit their celebration and style needs. It was a day full of sand, surf, sweet love and laughter. Graduation Party to Kick Off Summer! This past Saturday, we were invited to attend a beautiful high school graduation party. Recent Barnstable High School graduate, Courtney, wanted her party to be full of fun and whimsy while keeping the Cape Cod spirit. The Perfect Table developed a bright table that matched her needs and style. Adorned with pink, blue, yellow, and orange polka-dots, The table hosted two varities of cupscakes, sugar cookies with a pink lemon frosting, white chocolate covered pretzel rods, cream puffs and tasty treats ranging from sweet to sour. Accompaning the table of treats was a small lemonade stand, perfect for the summer season, with enough raspberry lemonade to keep any new grad cool and comfortable.